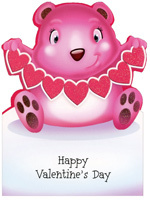 On February 14th, send a Valentine's card to family or friends and let them know that they are a big part of your life. 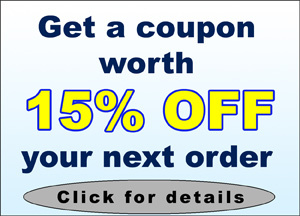 From humorous to sentimental designs, the PaperCards.com Valentine's card store has a great selection of cards to match your needs. More Info: A gold foil rose appears on the acetate window while splashes of gold foil create unique heart shaped patterns throughout the card. No additional postage is necessary when mailing this card. Inside: I love you and you love me - There's no better symmetry. More Info: Alternating red foil hearts can be found on the front of this simple Valentine's Day card illustration. Printed on recycled paper. Made in USA. Inside: Happy Valentine's Day, Angel. More Info: A cute angel holding a gold string and die cut heart appears on the square embellishment that floats just above the front illustration of this Valentine's Day card. 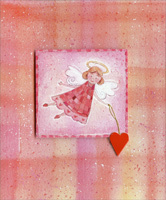 Shades of pink and orange with splashes of red and white serve as the background for the framed angel illustration. No additional postage is necessary when mailing this card. More Info: Made in USA. More Info: Features gold foil lettering. Printed on Recycled Paper. Made in USA. More Info: An actual miniature rose and red bow have been attached to the front of this unique Valentine's Day card, enhancing the gold foil column. No additional postage is necessary when mailing this card. Inside: It's time to hang out and do special things and enjoy all the fun this happy day brings! More Info: A generous use of glitter on the bear's feet and ears and the string of hearts make this Valentine's Day card shine. Made in USA. More Info: Features gold foil lettering. Made in USA. Inside: A godchild like you is like sunshine and song… 'Cause you brighten and lighten the days all year long! Happy Valentine's Day! More Info: Features gold foil lettering and sparkling glitter in the sun, hearts, butterfly, and flowers. Made in USA. More Info: Black foil is used to create the vine, hearts, and flower illustration on the front of this Valentine design. Printed on Recycled Paper. Made in USA. More Info: Embossing (raised up cardstock) creates a wonderful look and feel of depth in the hearts and frames on the front of this Valentine's Day card. Made in USA. Front: For you, Son - Proud of the boy you were. Proud of the man you've become. Inside: You're the friend that I count on to listen and care to be on my side in whatever I do… You're a wife to be proud of, so lovely and loving -- How lucky I am to be married to you! Happy Valentine's Day! More Info: An embossed checkerboard design frames this simple vase and heart shaped flower illustration. Also features black foil lettering. Printed on Recycled Paper. Made in USA. 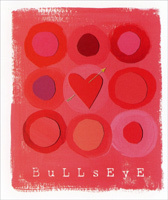 Inside: Happy Valentine's Day, Hotshot! More Info: Features a silver foil arrow. No additional postage is necessary when mailing this card. Made in USA. Inside: It's just me peeking in to say, You're on my mind and in my heart today. More Info: Small touches of gold foil around the die cut heart shaped window add just a touch of sparkle to this Valentine's Day card. The die cut window reveals a portion of the coordinating interior artwork. Printed on recycled paper. Made in USA. Inside: …just how wonderful it is to know someone like you! 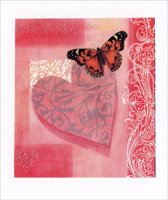 More Info: The short-fold front panel of this beautiful Valentine's Day card features a butterfly and swirls of pink. Glitter sparkles on the butterfly and along the swirling patterns. Pink foil lettering appears on the second panel of this tri-fold design. Printed on Recycled Paper. Made in USA. 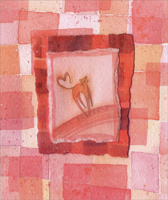 More Info: The short-fold front panel of this beautiful Valentine's Day card features a butterfly and swirls of pink. Glitter sparkles on the butterfly and along the swirling patterns. Printed on Recycled Paper. Made in USA. Front: This Valentine Is Special! More Info: Features black foil in the outline of the house, butterflies, flowers, and hearts. 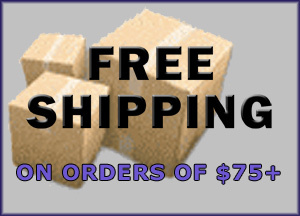 More Info: No additional postage is necessary when mailing this card. Made in USA. More Info: Printed on Recycled Paper. Made in USA. Inside: This happy kitty's here today to send my hugs and love your way. You make me smile so easily because you're the best Aunt to me. Happy Valentine's Day! More Info: Features purple foil lettering. Made in USA. More Info: Gold foil lettering, and gold foil accents in the hearts, flowers, butterfly, and bow make this card shimmer. Made in USA. More Info: Pink foil lettering on all 3 panels of this z-fold design, textured cardstock, and splashes of glitter throughout the hearts and flowers make this colorful design burst to life. Made in USA. Inside: Thank you for always bringing me happiness and showing how much you care. More Info: The wonderful earthtones on this Valentine's Day card are brought to life through the use of embossing and debossing in the circular patterns. 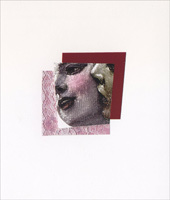 The raised and lowered areas of the cardstock capture light and create a depth that can be seen and felt. Rings of gold foil add to the 3 dimensional look and feel. Printed on recycled paper. Made in USA. Inside: After all these years together, I truly believe our hearts beat as one. 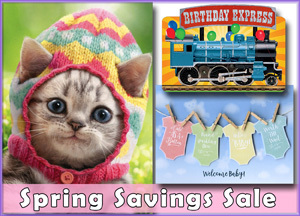 More Info: Features embossing to allow the images to have a 3 dimensional look and feel. Made in USA. Front: Giddyup Godson, on Valentine's Day! Inside: …And I just wanted to tell you how much I love you! 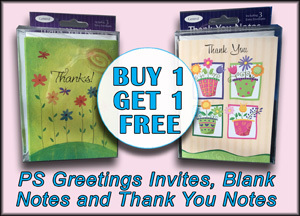 Inside: You deserve more than one wish so I'm sending two… One for being my cousin and one more for just being you! Happy Valentine's Day! Have Lots of Fun! Front: Quacky Valentine's Day, Granddaughter! Inside: It's Valentine's Day -- Waddle I do? Can't help myself. I'm quackers for you! Hope your day is simply ducky! More Info: Glitter accents border the heart and cute duck illustration, bringing a true sparkle to this Valentine's card for your Granddaughter. Made in USA. Front: Will you be mine, Valentine? Inside: I Love you from my head down to my webby feet. So won't you be my Valentine? I think you're really sweet! More Info: Glitter accents border the heart and cute duck illustration, bringing a true sparkle to the card. Made in USA. More Info: Gold foil lettering lays across a ghosted image of a single rose on the front of this Valentine's Day card for your Dad. 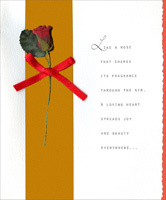 The interior features an insert with a smaller version of the rose that appeared on the front of the card. Printed on extra heavy cardstock. 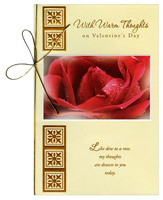 Front: With Warm Thoughts on Valentine's Day - Like dew to a rose, my thoughts are drawn to you today. Inside: Like dew to a rose, my thoughts are drawn to you today. Many happy Valentine wishes. More Info: A gold elastic stretch cord and bow accent this beautiful Valentine's Day card that features embossed gold foil squares and patterns, gold foil lettering, and an insert. Additonal postage required when mailing this card. Front: To the One I Love on Valentine's Day - I'm happy and thankful for every way you've touched my life with goodness. 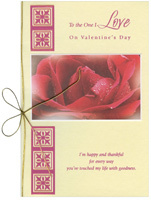 More Info: A gold elastic stretch cord and bow accent this beautiful Valentine's Day card that features embossed purple foil squares and patterns, purple foil lettering, and an insert. Additonal postage required when mailing this card. Front: Sweetheart… No other heart is quite so sweet. Inside: No other love makes me complete. More Info: This z-fold design features a die cut window on the front and second panels, allowing the interior image to be seen while the card is closed. The interior artwork shows a heart shape that is formed by flowers and branches. Heavy glitter brings a sparkle to the image inside the die cut window. Also features purple foil in the lettering, window frame, and swirled border. Made in USA. More Info: A white die cut heart with embossed swirls is attached to the front of this wonderful Valentine's Day card for your husband. A silver foil column stretches from the top to the bottom of the card and the front lettering appears in silver foil. Additonal postage required when mailing this card. Front: To My Wife… My Heart Belongs to You! More Info: This card's solid pink front panel is simple, yet elegent. Embossed flowers and hearts create a frame around the outside edge of the card while a die cut and embossed white heart is attached to the front panel. Also features purple foil lettering. Additonal postage required when mailing this card. More Info: A generous amount of glitter makes the purple heart shimmer and sparkle on the front of thid Valentine's Day card for your brother. Printed on Recycled Paper. Made in USA. Inside: When you see this Valentine, sure hope that you will guess Who loves you lots and wishes you good times and happiness! Have a Nice Valentine's Day! More Info: Embossing adds a unique 3 dimensional look and feel to this Valentine's Day card for your husband. The rich brown, red, and purple colors in the illustration provide contrast for the gold elastic stretch cord and bow that wraps around the front panel. Gold foil lettering, gold foil hearts, and an insert finish off the design. Additonal postage required when mailing this card. More Info: Embossing adds a unique 3 dimensional look and feel to this Valentine's Day card for your sweetheart. A gold elastic stretch cord and bow, gold foil lettering, gold foil hearts, and insert add more value. Additonal postage required when mailing this card. More Info: Embossed (raised up) hearts and stars with small touches of glitter add just a bit of sparkle to the front of this card. Inside: Sending all my thanks and all my love for all you do. More Info: Gold foil lettering and contrasting shades of color make this a great looking card for your Dad. Heavy cardstock and an insert featuring a full-color illustration that repeats the theme from the front image round out the design. More Info: Gold foil lettering and contrasting shades of color make this a great looking card for your Nephew. 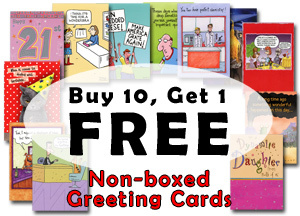 Heavy cardstock and an insert featuring a full-color illustration that repeats the theme from the front image round out the design. More Info: Embossed hearts and stars on the front and an insert on the interior are featured on this Valentine's Day card for your daughter. Made in USA. More Info: Embossed (raised up) hearts and swirls create a look and feel of depth on this Valentine's Day card for your grandson. The card is further enhanced with gold foil lettering and textured cardstock. Made in USA. More Info: The deep, dark shades of red in this single rose create a stark contrast to the silver foil lettering on the cover, allowing the message to appear to float above the rose. Printed on recycled paper. Made in USA. More Info: From a deep burgundy to a faint pink, rows of hearts fade into the white background as the spread across the page. 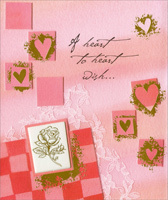 Embossing creates a 3 dimensional look and feel as the hearts “push out” of the card. Printed on recycled paper. Made in USA.